Our interview section allows busy industry leaders to quickly provide insight into rapidly evolving industry issues. If you have subject matter or industry issues you would like insight into or would like to be interviewed yourself contact us. sinclair@automatedbuildings.com Following are all the interviews published todate. Implementing Intelligent Building Solutions Energy is the most expensive component of a building, manage it like an asset. Buildings run and operate in real-time; manage them in real-time. Marc Petock, Vice President, Global Marketing & Communications, Tridium, Inc.
Video Analytics Increase Building Intelligence The IOS, unlike conventional room sensors, utilizes intelligent video analytics, which, besides being significantly more accurate, provide the ability to count the number of people within an area at any given time. This occupancy function allows building managers to very specifically determine how the space is supported by automated systems. Lyrtech, Inc. & ObjectVideo, Inc.
ConnectivityWeek 2010 – Buildy Awards The Award for an Industry of Innovation and Intelligent Connections Richard Coppen, Director of Operations, Clasma Events Inc.
IP- 485™ Technology? IP- 485 Technology Seamlessly Advances RS485 Twisted Pair Networks into TCP/IP Enabled SCADA Networks Daniel Drolet, Vice President of Business Development, PCN Technology, Inc. Integrated Workplace Management Systems By 2015, the technology will become even more collaborative, intelligent, ubiquitous, and indispensable. Bruce Kenneth Forbes is the Founder, President, CEO, and Chairman of ARCHIBUS, Inc.
2010 Niagara Summit With over 172,000 instances of the Niagara Framework in 45 countries and over 12,000 certified professionals, the Niagara Community continues to grow and expand into new areas. In continuing to support the Community as well as open technology, integration and connecting diverse systems and smart devices, the bi-annual Niagara Summit will take place May 2-4, 2010. Marc Petock, Vice President, Global Marketing & Communications Tridium, Inc. The Empire State Building Aims to become a worldwide model for the key cause of sustainability. Randy Storch, President, Convia, Inc./A Herman Miller Company. Connecting BAS with Smart Grid BAS players simply cannot ignore Smart Grid. It will provide the mechanism for energy generation, distribution and consumption for the future. Anto Budiardjo, President & CEO, Clasma Events Inc.
Lifecycle Management Approach to Building Performance Improves Cash Flow If you are constructing a new building, renovating an existing building, or simply looking to improve operations and maintenance, the life cycle approach assists in the decision-making process by correlating these choices with the financial impact and benefits to the organization. Paul Oswald, President, Environmental Systems Inc. The Multi Protocol Router The Router converts the disparate protocols and raises them to XML and serves out control pages using TCP/IP protocol. Many services such as trending, alarming, security, webpage design and many others are part of the onboard tool box. David Oshoway, President, Energetic Concepts Ltd. Address Operating Inefficiencies Recommissioning every few years or on an ad hoc basis is not the answer. Facilities managers need an Automated Continuous Commissioning solution that persistently and automatically predicts, detects, diagnoses and prioritizes system faults and anomalies that are constantly present in commercial buildings. David Wolins, CEO, Scientific Conservation, Inc.
Join YoungEnergy.org @ BuilConn's ConnectivityWeek How does the BA industry bring new blood into the workforce. These new challenges are a headache to us old folks, but are simply wonderful opportunities for the next generation, the iPod generation that lives and breaths issues like climate change, technology and the challenge of economic recovery. Anto Budiardjo,President & CEO of Clasma Events Inc.
New Current Sensing Ideas We listened to the customers! Jerry Woodin, V.P. of Sales, Senva Inc.
Niagara Video is our latest application in providing a comprehensive intelligent building solution that integrates all the common building functions-environmental control, intrusion detection, access control, lighting and energy management with video. Anto Budiardjo, President & CEO of Clasma Events Inc. It has the markings of it Ken, the perfect storm is forming. I don’t think 2009 will be business as usual. We will also be introducing our new BACnet IP Web Server, as well as our web based remote monitoring service and cellular remote monitoring products. What’s New In Controls Estimating? "To achieve a different result, you must try a different approach." EMerge Alliance Launched To Create A New Standard For Power Distribution and Device Control in Commercial Buildings. New, broad-based consortium assembling expertise in architecture, engineering and construction practices to establish a common platform for building interiors of the future. This year has been a very dynamic one, and we have seen many successes in demand response. Mostafa Shahto Systems Integration Engineer, Siemens Security Solution, Dubai, UAE. OPC technology is becoming a standard and is allowing for increased flexibility in integrating and customizing solutions locally. In cooperation with CABA, we are holding our fourth annual Building Intelligence Tour at AHR Expo in Chicago on January 27th. This is a full day educational seminar, and the focus will be on Advanced Integrated Lighting Controls. This year, we have seven important items to discuss and display…. On 11- 13 November 2008 in Atlanta the second Grid-Interop forum will bring stakeholders together to develop consensus on interoperability directions. The ZigBee Alliance has developed a set of energy efficient specifications known as the Smart Energy public profile. The basic requirement of the OPC architecture is to get data from Point A to Point B. Of course every user of the OPC system will place a different priority on the requirements. The next frontier for DR is to move beyond curtailment to leveraging the power of building automation systems that exist within or across collections of buildings such as a university or corporate campus. This future frontier will involve a more holistic or enterprise level approach to energy, referred to as Enterprise DR. Within an intelligent building all elements (such as lighting; heating; security, CCTV and alarm systems; access control; audio-visual and entertainment systems; ventilation, filtration and climate control, etc), talk to one another over a common platform and have the ability to respond to the real-time needs of occupants. The intent of our research is to provide documented evidence and build tools that can be used to educate and influence end-users, building owners, architects and contractors that a greener building can be achieved using intelligent technology, and that this greening will provide a tangible and significant return on investment. OV Ready is an XML-based intelligent video network protocol that standardizes ObjectVideo analytic rule, alert and configuration communications. Dynamic Pricing minimizes the use of expensive peaking capacity which sits idle most of the time but whose costs have to be recovered from customers year round. Utilizing standard interfaces and protocols for ease of interoperability with standard HVAC controls, while creating a web-accessible performance assurance solution that monitors results over the Internet from an operations center supported by expert engineers. With our solution, the SCADA environment is decoupled from the control environment, unlocking the architecture for open, competitive and consistent supervisory solutions. Our focus is on helping conserve energy in facilities; whether that is direct energy savings or by helping to monitor and control consumption. We customize our energy management systems from the hardware to the software and reach our energy saving goals with maximum efficiency. Commercial buildings are well-suited to enroll in DR, but many customers don’t know enough about the various programs or how they can participate. I been very blessed to be able to express and demonstrate my passion for buildings and our industry throughout my career. I would like to start a community called OpenLynx where I would like to bring these and several other open source initiatives together to discuss how we can all collaborate on a common goal for our industry. ConnectivityWeek was very significant as it incorporated seven different industry events under one roof for the first time, including DR-Expo. OPC is a communication standard for the transfer of process data to the decision makers in real-time. for upgrading to 'Smart or Intelligent' Buildings. Moving from automated meter reading to advance metering infrastructure, smart meters and Home Area Networks of smart energy devices create new security challenges for metering companies and consumers alike. Take action with convergence and intelligent buildings strategies, use technology for the right reasons and deal with the real roadblocks. We take a holistic view of the building, this means understanding the purpose of the building, how people utilize the building, what business processes are in use and how the mechanical systems were designed. Smart grid activities continue to build steam as we apply automation to enhance electric system operational efficiency and reliability, while better enabling the integration of environmentally sensitive approaches to energy use and production. Rodney (Rod) M. Boucher, CEO of Microfield Group, Inc. The advances in next generation demand response we are seeing today are only the beginning. As more technologies such as smart meters, economic distributed solar power, advanced storage, and enhanced software platforms enter the market, the opportunities for demand response and other market driven opportunities will increase dramatically. A unique online-only event on energy and sustainability June 10 & 11 on the Web. Video Surveillance Continues to Grow—But Are We Letting the Bad Guys Get Away? We now search for good ideas, emerging technologies, innovative companies, best practice case-studies and industry thought-leaders, from around the world and not just in the United States. The world is changing very quickly and we have to watch the globe if we are truly going to keep paces with the advancements in our industry. MEP Jobs is the leading supplier of jobs and skilled industry talent for the mechanical, electrical, and plumbing industries. Energy management is more than just good for the environment and local communities – it’s primarily good for the bottom line. There is definitely a need for manufacturer-independent certification to legitimize and provide credibility to the industry. George B. Huettel, PE, President, Cyrus Technologies, Inc.
A VBOC approach towards building controls is not only more user friendly for the average tenant or consumer of information, but it is kept up and running by the outsourced supplier. In a twist of roles this month the interviewer gets interviewed By George Thomas, President of Contemporary Controls. for their newsletter The Extension. What is Performance Based Building Design & Operations? That is why this position paper is a developing project that is intended to be fueled by the good ideas and concerns of all interested readers and reviewers. I hope all the automatedbuildings.com readers will join the process. We ask that all interested in this issue submit comments on the paper – and future versions as they are developed. Marc Petock, Director, Global Marketing & Communications, Tridium, Inc. The 2008 Niagara Summit is an open exchange conference that focuses on interoperability, integration and connecting diverse systems and smart devices. Anto Budiardjo, President & CEO, Clasma Events Inc. The challenges I hear now are: how to make this growth happen, how to improve business, reduce risk, find resources, and generally, how to deliver solutions to building owners. CABA will be coordinating with Eaton Corporation at a two-day charrette, which will allow approximately 40 people to gather in March. The IBWA formed informally in 2004 from a few in-building wireless product and service providers and commercial real estate owners. We felt that there was an inherent value in the implementation of in-building wireless and we decided to set out to quantify it. OPC is a communication standard that enables controllers and PCs to communicate with each other to exchange automation data. The market is missing the end devices and we wanted to be the first to introduce this wireless valve actuator. Building owners and facility managers now have the ability to select building systems, components, smart equipment, and applications and services by a "best of breed" approach. In the pursuit of clean technologies for industry I came across Tom Hartman and his work and immediately saw an opportunity. The concept was obvious to me. Take what was an engineered service and convert it to a deliverable product. The AccuValve is an air flow control valve used in labs and critical environments for accurate air flow measurement and control. There are many areas within the LEED Green Building Rating System to which Intelligent Building practices and technologies may be applied. Trend grew up in the UK. They’re the dominant player in the controls industry in that country by far, and have been for many years. They are well established in Europe and the Middle East, and the Americas are a huge growth target at the moment. With all the attention to energy conservation, air quality, occupant productivity and green buildings, why do you feel the market won't grow at a faster rate? A great deal of what’s been talked about related to the future of buildings will start to unfold in 2008. Anto Budiardjo is President & CEO of Clasma Events Inc. The difference between GridWise and Demand Response? The fact that the North American GRID system operators have finally created DR programs that are funded to the same degree as new generation capacity and are accepted by the reliability councils is a positive step in the right direction. The NewEnergy Alliance is a group committed to driving innovation in the building automation industry that will create smarter, more energy responsive buildings. The NewEnergy Alliance has been formed in response to a growing commitment to sustainability and to reducing the carbon footprint of the established building environment. Terry Swope, President & Sean Jones, Training Manager, Lynxspring, Inc. Unique training programs targeted to the building automation, energy services, power/utility, and industrial sectors. It’s clear that in the last year our clients and society in general have moved much further in their expectations for sustainable buildings than this industry has moved in our ability to effectively implement them. Trevor S Palmer, Marketing Manager, Viconics Inc. Essentially we have enhanced the VT7000 series communicating thermostats with new features and applications. The task force consists of board members, IBRM sponsors, and selected consultants. This year’s conference still features our successful exhibition with industry companies, as well as expanded content to include information on BACnet (ASHRAE standard 135-2004) – a Data Communication Protocol for Building Automation and Control Networks, cutting-edge work for open systems and next generation lighting, as well as the latest in intelligent buildings. will join forces with BACnet International to provide the latest information you need on Building Automation and Sustainability! For integrators and contractors, Demand Response or DR means immediate business returns and an opportunity to leverage DR to establish a better value proposition to their customers. For owners, DR will provide a way to reduce energy costs by tapping into the incentives the utilities are providing right now. Digi launches Drop-in Networking solutions to help organizations easily automate their facilities. In short, there can be RF interference in any band. Some bands are more crowded than others, and some applications are more susceptible than others. If you think of the effort to make automation systems interact as a “distance to integrate,” then the objective of the Grid Interop meeting is to engage business leaders and integration technologists across the electric system community to develop actionable steps that close or reduce the distance to integrate. For practitioners participating this space, a great deal was uncovered in how Building-IT convergence is starting to play out; delivering real value to owners and tangible opportunities for the industry. The Objective and criteria for the award is to highlight real-world application/implementation of GridWise Architecture Council (GridWise AC) interoperability principles in products, services and projects. The conference was an interactive environment where attendees helped shape big ideas, such as Buildings 2.0 and GridWise. The National Building Information Modeling Standard (NBIMS) and the oBIX committee have met to explore relationships between the standards, focusing on whether Energy Models developed directly against NBIMS models can be compared to live data from control systems read by oBIX to produce live models (or instantaneous commissioning)". BuilConn continues to provide a forum for industry players to discuss and endorse new technologies and solutions which promote the converged network. The Buildings 2.0 initiative promotes green initiatives and sustainable designs as well as the use of Information Technology to further the vision. The framework is more abstract than an architecture or a design, and it certainly isn’t a solution you can implement. Building Intelligence Quotient is an assessment and rating tool and a design guidance tool. The NJATC is taking an active role in the upcoming BuilConn because there seems to be a general feeling in the building automation industry that there is a “lack of training” in the field. This eliminates the need for multiple host workstations for each building system and most importantly now allows the leveraging of the IP network and all the application, services and client views that are available worldwide. A smart customer with a smart building will know what prices may be at certain hours and what technology exists in his building to take advantage of this knowledge. We believe, for example, that electrical “loads” (e.g., equipment and appliances) must actively participate in the day-to-day and even minute-to-minute) operation of the electric grid in the future. Airbee Wireless is a leading end-to-end provider of intelligent embedded software solutions for low-power RF mesh networking. 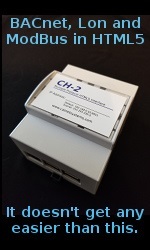 It's not just the least expensive but also the smallest (only uses 35 mm of Din rail) LON over IP router on the market. In most customer's portfolios of buildings, 70-90% of the systems are more than six years old (Y2K upgrade) with some up to fifteen years old...or more! Constellation Energy has chosen to be a Platinum Sponsor at GridWeek in order to use this forum to help advance our customer choice agenda and the common goals of renewable energy, new energy technologies, and distributed resources. All of us need to ready ourselves to participate in projects wherein we can assure that sustainable principles are really applied so that energy use and resource depletion are truly reduced by orders of magnitudes. Marc Petock, Director of Marketing, Tridium, Inc. It is the first security system to be built entirely on the NiagaraAX® Framework and can connect seamlessly to any building automation system. Energy Manager is an advanced energy management and information system that integrates with building systems. Device Networking is the ability to quickly and securely connect virtually any type of equipment to the network or Internet via Ethernet or 802.11 wireless. William LaPointe - President and CEO, Spinwave Systems, Inc.
Wireless sensors and networking have the potential to transform the building automation market due to lower installation costs and flexibility that will support a range of applications that were not feasible or possible with a conventional wired system. To be discussed at GridWeek will be hot topics such as demand response, real time pricing, alternative energy and distributed generation. Many of the solutions to the shortfall in electricity will come down to reducing demand especially at peak load times, and much of this will happen in buildings through building automation. Until recently, integrated lighting control was specified in Division 16 because of tradition; not because it was efficient or effective. The result of this out of date specification method make integrated lighting control needlessly more expensive and troublesome to construct. The focus of BuilConn ME is on communicating to owners and developers how they should be looking at smart buildings and how they should be thinking on designing and procuring the systems that make their buildings intelligent. Being approved as an OASIS committee standard means that oBIX has had a successful public review and that the committee has voted for approval. Craig Arnott, NSW Controls Team Leader, Airmaster Australia Pty. Ltd. I would have to say there were no real obstacles, however the challenge was to install new controls in 630 hotel rooms, 18 function rooms/areas, 42 office and public area air conditioning units, plus the chiller and boiler plants - in a 'live' building that consistently has hotel occupancy figures over 90%. As with the first events in the US and Europe, this Singapore event will focus on gathering the players and thought leaders in the new world of convergence. After the success of the BuilConn events in US and Europe, Cisco was excited to learn that the event was coming to Asia. When I use the term smart buildings, I define it as building systems that collect data, process it in the traditional sense of performing numerical analyses, then interpreting the results of those analyses to reach conclusions about the status of the building or the system, and finally automatically implementing appropriate actions in response. MIT Enterprise Forum event on November 8 will be about new technologies and real-world energy strategies for commercial buildings. ConnectivityWeek is what we call the week of activities surrounding BuilConn. It is our customers that that will change the industry, we need the technologists to drive the boundaries and we need end users to be convinced of the business case and the value proposition it will bring to their organization. Everyone seems to want to know what GridWise is about and how it will affect their world. BuilConn has been a great venue for us to share our vision and our go-to-market strategies; but also proved to be a great venue where we were able to learn about the dynamics of the building technologies world. Standards-based solutions provide the security of having interoperable components available from different vendors. ZigBee now is the only open standard developed specifically for the short-range wireless monitoring. Brian Thompson, Founder, Managing Director, SENSUS M.I. This year we will project videos of the FDDI engine working on real machines and have a fan that visitors can control on the Internet with a 3D control. Trevor S Palmer, Marketing Manager Viconics Inc.
We have compiled a large shopping list of items on what a controls integrator would need to use our thermostats with system X or Y.
Embedding wireless ZigBee sensors and controls in building automation networks has huge potential for enabling cleaner, safer, greener buildings through reduced energy consumption, more efficient building utilization, better security, etc. Our SI's are joining forces with the Cisco Account Managers, who have learned about RZ through the CCRE Training Programs and summits held worldwide as well as from RZ's Cisco Partner Solution Profile. The IP-852 channel is a standard in Europe (EN 14908-4) and the US (EIA/CEA-852). Looking ahead, we will continue to invest in both R&D and marketing to both meet the needs of our existing customers and to more rapidly expand into industrial automation and M2M applications. Anwer Bashi, Senior Research Engineer, Computrols, Inc. Fuzzy logic is a proven AI technology for mapping human knowledge into computers and creating sophisticated control strategies using human-understandable logic. As building automation technology gets more complex and interconnected, and as more is expected from building engineers, artificial intelligence will have to play a greater role in building automation systems. Life-cycle costing has become de rigueur for anyone embracing sustainability. What is the Mediator™ platform? The Mediator™ platform provides an integration framework, known as the Multi-Protocol Exchange (MPX™), which allows for the convergence of multiple disparate building systems onto an IP network. ConnectivityWeek is our new umbrella brand to “house” BuilConn, M2M, GridWise and Wi-tivity. It’s a brand we will use around the world to gather subjects related to connectivity of devices and systems, such as building controls and automation. We felt that there was a need for a conference that was delivered regionally, summarized the issues and was focused on owners and consultants. Digital signage has the potential to transform a building into a modern and highly attractive venue with substantial revenue potential. Allows Niagara users to use our system software to quickly build wireless networks and manage them in the same context they manage their wired devices. It’s the first and only product that bridges the gap between multiple new wireless systems and existing control systems. Partnership to reduce the cost of automating buildings with ZigBee. BiQ stands for Building Intelligence Quotient. BuilConn participants will learn how the Intelligent Building has morphed into the Intelligent Enterprise and is on the way to the World Wide Grid. GridWise was a topic at BuilConn last year, but it is a strong force this year. Dramatic events and price spikes in the energy world combined with a continuing emphasis on interoperability, and a national focus on business developments in the “Energy Space” make this a must participate event. Glen Allmendinger, President & CEO Harbor Research, Inc.
A simple way to look at this in terms of a business model and economic returns is to ask whether my device is going to be part of an ecosystem at all, who will be in the value chain and how will they organize around my asset or vice versa? Today we’re standing at a very significant watershed of change; this is not only my prediction but represents the billion dollar actions of companies from major traditional players to new IT entrants. This is also being driven by the demands of owners, now inquisitive (and willing to spend money) about how IT can better their buildings. LONMARK members — including manufacturers, distributors, engineers, system integrators, facility managers and end-users — will learn how to find new business, make new partnerships and leverage membership investment. What can you tell us about this control technology and why it deserves a special name. The ZigBee Alliance is a global ecosystem of companies creating wireless solutions for use in home, commercial and industrial applications. Serge Bohdjalian, Senior Marketing Representative, Matrox Graphics Inc. Various studies report productivity gains of 10 to 50% from using multiple displays. Productivity is improved by reducing the amount of time spent moving information that doesn't otherwise fit on screen. The 2006 Niagara Summit is all about practical ideas, expanding knowledge and exchanging information that members of the Niagara Community can use today. This year’s theme is Connecting Minds and Machines. Sensicast’s wireless sensor systems operate in buildings across North America and Europe providing robust and reliable monitoring of temperature, process, and energy as well as information for predictive maintenance. Al De Wachter, President, Independent Control Specialists Inc. While industry complexity grows and technologies remain forever in flux, the tasks of estimating, design and submittal can finally be rationalized and standardized. We will have speakers from the many areas where Web Services is being used, ranging from the oBIX and ASHRAE initiatives to applications available from Echelon, Gridlogix and others. These projects assume that technology will continue to change our lives and they are incorporating this vision into these Real Estate projects. IT-Convergence – Have we crossed the chasm? Not quite; for the last three years techies and visionaries have taken the plunge and have invested in IT-Convergence solutions, but the pragmatists still have to be convinced of the business case. IBB Back at BuilConn 2006! The IBB seems to have taken on a life of its own with people interested in joining us on stage. Honeywell invested because we believe in Tridium’s technology and its people. Our customers should see a renewed commitment and investment along with the same great technology and support. Frank Capuano, President of Strata Resource Inc., Manager of the Buildy Awards Program and Editor of the BuilConn Update for Clasma Inc.
Robert M. Metcalfe, Chairman, Ember Corp.
Our mission is to network embedded micro-controllers with standards-based radio semiconductors and protocol software. We will be a resource to the greater body of BACnet users, product providers, service providers, and building professionals. It was a perfect start of 2006, a year that will be a critical year for convergence. Cisco’s participation will make BuilConn Palm Springs a must-attend event for vendors, integrators, consultants and owners. John Edler, VP, Kiyon Inc.
Three factors that differentiate Kiyon are standards compatibility, ease of use, and state of the art wireless network technology. The platform allows for the movement of data between dissimilar systems such as HVAC, facility management systems, database information, lighting, security/surveillance, etc. What’s new for 2006 for EBTRON? Dave Dougan, President, EBTRON, Inc.
CENSus is a patent-pending new technology that uses non-PIR thermal principles to physically count and track human entrants and exits from a space. The LISA chip has features that support an Ethernet port, two LonWorks (EIA-709.1) ports and one BACnet port. Between HP and Cisco’s significant presence there, the release of the convergence study by i&i ProPlan, our partnership with ZigBee and OASIS and the many presentations and discussions on the subject, BuilConn Europe 2005 could be regarded as the turning point and uptake of Building-IT Convergence. The Pyxos platform is the world's first platform for embedded control networks – networks inside of machines. The Building Intelligence Tour is a series of educational seminars that help building owners, consulting engineers, integrators and suppliers understand the benefits, technology and solutions involved in Intelligent Buildings. Richards-Zeta’s OMEGA® building intelligence platform, Panduit’s Network Cabling Infrastructure solutions and Cisco’s VoIP telephony, data and network storage solutions come together today, to better manage the buildings of tomorrow. We want to accelerate the emergence of a standards-based robotics components market so developers can bring new robotics solutions to market faster using existing, proven, interoperable components. GridWise is a DOE initiative to bring the North America electric grid into the 21st century. The intent is to bring together in one place information on the full range of technologies in automation so that those working in the field and also those wanting to understand it better can get a good grasp on the technology. A network configuration manager (NCM) is a tool that can help network and facility managers better monitor and control the devices on their network. ....IP-enabled gateways that talk XML and Web services, to IP-centric products such as servers, hosted services, BACnet Web Services, oBIX, to a great deal of discussion on IP-based standards. What does the Building Intelligence Group offer to Systems Integrators? The intent is to help elevate the professionalism and caliber of the System Integrator staff. This year’s event will explore actual deployments and solutions as well as include information on present and evolving technology. Anto Budiardjo, President of Clasma, Inc.
.....it is clear that IP-based technologies (XML, Web services, etc.) will dominate upper levels of building systems architecture. What is The Equal Marginal Performance Principle? The Equal Marginal Performance Principle is an entirely new way of looking at systems that are composed of multiple power-modulating components such as fans, chillers, and pumps. I am really trying to connect with the European energy community to identify some speakers that can see the long term benefits of integration and interoperability as tools to improve electricity reliability, but also to save money. "In Amsterdam, wireless will be the strongest single subject covered"
John Petze, President & CEO, Tridium, Inc.
We believe that any real solution to interoperability has to embrace existing protocols and devices as well as the growing number of standards out there. The new standards are great as a path forward, but you need to provide owners with existing systems with a way to get on that path. Bill Gnerre, CEO & Cofounder, Interval Data Systems, Inc. It affects building and plant operations, design and construction engineering, utility billing, proactive maintenance, budgeting… pretty much everything under the facilities and utilities umbrellas. At CGNA, we see two-step distribution as the preferred channel for manufacturers of integration products to go to market. Wireless mesh sensor networks have been created to remove not only the costs of wires, but also the complexity associated with large volume wireless sensor deployments. Frank Capuano, President, Strata Resource Inc, & Mark Pacelle, VP Marketing, Millennial Net Mesh networks can optimize or increase the visibility into dynamic systems, such as the environmental conditions inside a commercial building or the condition of machinery in a manufacturing plant, without the cost and administration of a wired network. Steve Nguyen, Director Corporate Marketing, Echelon Corporation We see the industry moving to a point where EVERY automation system, from HVAC to lighting to blind control will be accessible and controllable via an XML feed of some sort. Paul Ehrlich, President, Building Intelligence Group In 2004 Paul Ehrlich was awarded the first ever Buildy Vision Award. This award was based on peer nominations and voted on by BuilConn attendees. Ed Richards, President & CEO, Richards-Zeta OMEGA is the first, and last, intelligent building solution you will need to manage the assets of one or multiple facilities in today's enterprise-wide business. John Petze, President & CEO, Tridium, Inc. Niagara Appliance builds in multi-protocol support in a single solution. The factory ships one product no matter what type of system it will be integrated with. Jay Althof, Vice President Global Control Systems Group, Trane Our industry must focus on XML not as a technology, but as a solution; giving insight on business system architecture implications that decision makers must understand. Steve Jones, Managing Partner, The S4 Group, Inc. by making the data previously locked inside the Metasys® system available to other BAS and IT systems via open interfaces. Mark A. Noyes, CEO & President, WebGen Systems & Andy May, President & CEO, Millennial Net One of the exciting characteristics of wireless sensor networking is that it really does open up possibilities for new products and services and creates flexibility in systems that have not traditionally been flexible. Anto Budiardjo, President of Clasma, Inc., We have a lot more subjects and a lot more people with deep understanding of these subjects. Ron Zimmer, President & CEO, CABA The issues to be covered include changes in CSI MasterSpec, LEED, CLA initiatives, M2M Device Networking, and how the information technology industry works. Anno Scholten, CTO, Plexus Technology Inc The Development track at BuilConn is designed for development engineers and product designers that are interested in the latest technologies being applied to building automation systems: XML/Web Services and Wireless. Barry Hasser, Executive Director of LonMark® International We will discuss the key trends driving open systems and provide key perspectives on how to make open systems a common element of your business, whether you are an end-user, contractor, specifier or supplier. Jim Lee, President & CEO, Cimetrics Inc. The track will include a number of key BACnet experts to talk about the status, plans and implementation of BACnet. It is an exciting time, with the pieces falling into place, and the role of oBIX becoming apparent to a larger audience. Now we have to focus on the stylistic issues of XML, of making oBIX look like what the Enterprise is looking for, and we need the eyes of the entire controls industry to look on what we have, and to submit suggestions as to how to make it better. A session that will help systems integrators, consulting engineers and facility owners and managers understand Niagara. The concept of Enterprise Integration is that groups of buildings can now be centrally managed and also that we can connect Building Systems to Business Systems. What are the benefits and business value of being able to integrate an ‘open’ building automation system onto a standard IT platform and into the business management systems in place at virtually every Fortune 1000 company today? The FM@BuilConn track enables attendees to learn from those who have already experienced success applying technology to facility management. The technology community needs to spend the first hour of every new relationship listening to what the client does and what are their business drivers, their problems that maybe technology can solve. Glen Allmendinger, President of Harbor Research, Inc. The move to M2M is happening, and the pace of adoption is accelerating. It is not only possible, it is here. CaseStudies@BuilConn is all about peoples' success planning and implementing the new reality. Frank Capuano, President Strata Resource Inc.
Blues@BuilConn - The "Interoperable Blues Band"
William Sandoval, Business Development Manager, Digital Systems, Philips Lighting Electronics/Advance Transformer Zigbee is a short range, low-power protocol specifically designed for small building devices such as thermostats, lighting controls, ballasts, environmental sensors, and medical devices. Aaron Hansen, Senior Software Engineer, Tridium The future of building automation will be a new breed of applications that connect facilities with traditional business units such as human resources and accounting, for functions such as cost savings and performance management. Barry Haaser, Executive Director of LonMark® International We expect the seminars to appeal to a number of industry professionals wrestling with open systems issues. The content is very rich and will be useful for architects, building and facility managers, consulting engineers, electrical and mechanical contractors, and system and network integrators. Jack Mc Gowan, President of Energy Control Inc It seems inevitable at the beginning of a year to look back and consider last year in review. What progress was made over the previous months? In that light I took some time to visit with Jack Mc Gowan recently to get his perspective on significant events in integration and interoperability. Thomas J. Lohner, P.E., Vice President, TENG Solutions The IB Ranking System will be an online tool intended to assist building owners/managers, the commercial real estate industry and other industry stakeholders assess the level of integrated systems within a building (i.e., develop a BIQ). Anto Budiardjo, President of Clasma, Inc., December 2004 I think the stars are in alignment, building owners are truly starting to realize what is possible, the economy is steady, products are becoming available, and the distribution is primed. Steve Tom, PE, PhD, Director of Technical Information, Automated Logic Corporation November 2004 In a little over a year we’ve had over 16,000 visits to the CtrlSpecBuilder web site. That may not sound like a lot compared to, say, Amazon.com, but CtrlSpecBuilder is a very specialized site. Even the most hard-core HVAC geeks don’t spend their Saturday nights surfing the web to see if there’s anything new on HVAC Controls. Lloyd Spencer, President and CEO CoroWare, Inc. November 2004 Mobile service robots can monitor the efficiency of heating and cooling systems in real-time by roaming throughout a building, then reporting the results to maintenance personnel. Stuart Berjansky Senior Product Manager, Controllable Lighting, Advance Transformer Company November 2004 The introduction of DALI brings intelligence inside the ballast, transforming it to a “smart” device and ultimately allowing end users to set up virtually any lighting system configuration they desire. DALI’s versatility makes it ideal for use with the most sophisticated Building Management Systems (BMS). November 2004 In an interview conducted by Frost & Sullivan, Anto Budiardjo, Clasma President, shares his thoughts on leadership and what it takes to succeed in the rapidly progressing networked buildings industry. Greg McFarland, P.E., Mechanical Engineer, Davis Design October 2004 I use it on any project that needs more than just a standard programmable thermostat, though I do use it occasionally on those types of systems when the system might be networked in the future and I want the current system to be ready for the connection. Scott Sinclair , P Eng, Owner, President, Sinclair Environmental Solutions October 2004 CtrlSpecBuilder is a great tool that allows an engineer to design a DDC system with the latest ASHRAE guidelines with BACnet Protocol. Paul Ehrlich and Anto Budiardjo September 2004 The BuilSpec seminar series was created to provide technical owners and consulting engineers with an objective and clear understanding of the technologies, initiatives and trends that are reshaping the building systems playing field. Jeff Reid, Owner Automation Parts Warehouse September 2004 We are a new start-up company providing an outlet for customers who have existing building control systems an avenue for affordable and reliable pre-owned parts. Jennifer LaFond, Group Vice President, IDG World Expo September 2004 Unlike the other sensor or networking events out there, this event addresses the specific challenges and the specific opportunities that one will encounter when creating a wireless sensor network. Alan Kell MSc BSc, i&i limited September 2004 We’ve got a focussed exhibition of leading companies and organisations, and an extensive conference programme designed to address three key questions: (i) why are intelligent buildings needed? (ii) what systems and solutions are now available for intelligent buildings? (iii) How do we deliver and manage intelligent buildings? Thomas J. Lohner, P.E., Vice President, TENG Solutions August 2004 The IIBC was formed in 2002 as a direct result of the Technology Roadmap for Intelligent Buildings, a project funded by a number of Canadian government departments and managed by CABA. Keith Gipson, CTO, Impact Facility Solutions August 2004 By taking historical data collected from your HVAC, chiller and other systems and having a system that is not only capable of collecting, trending and graphing your data, but can also apply algorithms to determine how well your facility systems are actually operating is very powerful. Tracy Markie, President of Engenuity Systems, Inc August 2004 More open systems: This will be driven by lower installation costs due to better implementation and deployment tools and technologies, wider product availability, more standards, wider acceptance, and easier, even seamless integration of systems. Jim Lee, President & CEO, Cimetrics Inc. July 2004 The interest level for BACnet is growing and the industry is looking at ways of developing and using more BACnet products to implement more BACnet system solutions. Anto Budiardjo, President of Clasma, Inc. July 2004 The objective is to bring much needed education on the dynamics driving open systems, integration and IT convergence to consulting and specifying engineers. Maria Corsi, Technical Director of the National Building Controls Information Program, Iowa Energy Center July 2004 DDC Online is a web-based resource that specifying engineers, commissioning providers, building owners, facility managers and others can draw upon to make informed decisions about building controls based on credible information. Madeleine Bath, Clasma July 2004 Being predominantly a European event, it was important for us to have key players in Europe; I believe you currently work mainly in North America which is why you may not know many of the names. In Europe these names are the thought leaders in integration of HVAC, Security and IT. Anto Budiardjo, President of Clasma, Inc. June 2004 BuilConn Europe is very much a Europe event; it’s not just a transplant of an American event into Europe. The people driving this are European (from Clasma’s London and Brussels office), the advisory board will be predominantly European and many of the speakers will be European. Steve Fey, Vice President of Sales, Tridium, Inc. June 2004 The Niagara Appliance program is a solution developed for OEM equipment and service providers. Barry Haaser, Executive Director of LonMark® International June 2004 For the first time, the LonWorld event will be held in Asia – the fastest growing market for the LonWorks platform. Toby Considine – Technology Officer, Facility Services, University of North Carolina – Chapel Hill June 2004 I am excited to be involved with group that I think has the potential to change the controls industry, to change what owners and operators can expect from buildings, and to advance several values that I hold very dear. Rami Belson, CEO of Energex Inc. June 2004 We have presented the industry with a remarkable tool which can address every aspect of their operations and help them achieve better guest experience with far greater efficiency. John Petze, President & CEO, Tridium, Inc. May 2004 A Niagara based system empowers end users to get above the protocol debates and simply specify systems that meet their business needs with the confidence that it can be done cost effectively with standard protocols and can be connected to their enterprise systems. XML in Building Automation -- Is it REALLY the next BIG thing? Andy McMillan, President & CEO, Teletrol Systems Inc. May 2004 I believe there are other technologies on the horizon that have as much or more potential to re-shape the BAS industry at a strategic level. Wireless mesh networks and MEMS sensors come to mind. Jeanne Dietsch, CEO, ActivMedia Robotics May 2004 We're giving automation the ability to move objects in space. Most facilities managers and building automation specialists think in terms of sensing and controls. Very few think of moving anything other than elevators or, possibly, doors. Keith Gipson, CEO/CTO, Impact Facility Solutions May 2004 Even though the emphasis of this year's BuilConn event was not focused on end-use customers visiting vendor's booths, like a typical trade show, my company already is benefiting from the alliances and partnerships that we were able to solidify and establish with companies we may have previously looked at as competitors. BuilConn 2004 What are the challenges now? Anto Budiardjo, President of Clasma, Inc., May 2004 If you say that open systems is a given and the use of IT technologies is also a given, the thing for the building systems industry to figure out now are two things: Firstly, manufacturers need to create a new generation of products and services using this technology. Secondly, we as an industry need to try and figure out the new types of applications brought about by this new set of opportunities. Anto Budiardjo, President of Clasma, Inc., April 2004 If you plan to work in the area of integrated and intelligent buildings, in the area of the convergence of Building and IT, there is only one place to be in the middle of April - BuilConn in Dallas. Leighton Wolffe, Director, Energy Partner Program, WebGen Systems April 2004 In the spirit of BuilConn, the IBB is all about players in the industry playing together, in this case literally. Anno Scholten, VP eStructures April 2004 The XML Pavilion will feature technology demonstrations showing the extensive potential of XML and Web Services in a cross-section of the buildings industry including security, HVAC, gateway, enterprise and IT solution providers of technology. Ron Brown, CTO, Gridlogix, Inc April 2004 The market is searching for a specialized IT centric Enterprise Application Integration framework designed to turn automation and control systems and their devices into easily accessible data sources for business systems. Dirk Mahling, Ph.D., Chief Technology Officer, WebGen Systems April 2004 Thus open protocols open the domain of buildings and energy control to the advances already seen in other fields such as computerized medical diagnosis, image stabilization, or automated battlefield management. Jay Althof, Vice President of Controls Product Planning and Support, Trane, Global Controls and Contracting April 2004 Information technology and the Web is the future of controls platforms. Trane is committed to playing a role that best helps develop the promise of XML-based systems. Gordon Newman, Marketing Coordinator, Greystone Energy Systems Inc. April 2004 Relationship marketing is developing a close bond with your customer by dealing with them on a personal level. Philip Sencer, Senior Vice President, Profile Systems, LLC. March 2004 We communicate to our controllers located at a customer's site and have the ability to schedule, turn-on, turn-off, monitor and control lighting, HVAC and other critical components. Tracy Markie, President, Engenuity Systems, Inc. March 2004 We see most of the non-systems products going down the commodity route. These would include end devices such as sensors and actuators as well as network infrastructure devices like routers and gateways. Glen Allmendinger, President, Harbor Research, Inc. March 2004 The upcoming M2M Expo is really the first large scale conference and exhibition for the M2M space. Tish Smith, Director of Client Services, Clasma Inc. March 2004 The Buildy Awards are a new initiative to recognize key contributors to the building systems industry, contributors who make the vision of integrated and intelligent buildings a step to reality. Phil Bomrad, Director of Marketing, Tridium - February 2004 The summit will assemble hundreds of professionals to share ideas, identify opportunities, and investigate complimentary products and technologies. We will have intensive workshops and panel discussions with respected industry experts, focusing on fueling new ideas. Anto Budiardjo, President of Clasma, Inc. - February 2004 2004 is starting to look like the year of convergence in the buildings industry. Probably the most interesting and core piece is the realization that XML and Web Services (XML/WS) will be a unifying technology, a catalyst for convergence. Anto Budiardjo, President of Clasma, Inc. - January 2004 2003 was a wake-up call. It should be remembered as the year that the next generation of building systems started to take shape. Paul Ehrlich, Business Development Leader, Trane Global Controls - December 2003 oBIX is an industry wide initiative to define XML and Web Services based ways to present buildings related information. Anto Budiardjo, President of Clasma, Inc., - December 2003 We're glad that BuilConn can be the annual venue where the people involved can physically convene, meet, discuss and get to know each other. Al De Wachter, President, ICS (Independent Control Specialists Inc) - December 2003 All changes are aimed at making estimators and designers more productive. Clifford McGarvey - October 2003 Do you remember how much more you learned about mathematics after you bought a calculator to do the repetitious work; an application specific program will help you the same way, to view the estimate as a whole system. Anto Budiardjo - September 2003 The impact of having an XML-based standard for buildings is perhaps the linchpin in the convergence of building systems with the IT infrastructure - it is something this industry must support in order to grow. Keith E. Gipson, CEO and CTO, Impact Facility Solutions - August 2003 I think one "killer app" in the Facility Management industry is automated diagnostics. Anto Budiardjo, President of Clasma, Inc. - July 2003 We are seeking input from integrators and contractors on the subjects they feel warrant in-depth sessions. Byron K. Hill, Ph.D., Director, Marketing/Systems Technology, Johnson Controls - June 2003 Building automation continues to benefit from growth in Web-based tools and advances in information technology. Johannes Rietschel, Founder and CEO, Barix AG, Zurich, Switzerland - June 2003 Internet Protocol communications is the easiest, most flexible and standard way to integrate and connect building management and security systems. David Peterson, Director of Strategic Marketing, The Watt Stopper, Inc. - June 2003 DALI stands for Digital Addressable Lighting Interface, and as a tool for lighting systems, it has a great deal of potential. Anto Budiardjo, President of Clasma, Inc. - June 2003 Our role here is to facilitate communication in the industry; what we always say is, "When people interact openly, magic happens!" Keith E. Gipson, CEO and CTO, Impact Facility Solutions - May 2003 Personally, I believe that the death of proprietary systems, as well as the intersection of IT and the Building Controls industry took place last week at BuilConn. Things will never be the same again. Frank Capuano, President, Strata Resource Inc. - May 2003 Everyone left with the understanding that XML and web services are not buzzwords, but are in use today. Cam Rogers, RLE Technologies - April 2003 Its ease of installation is ideal for both retrofits as well as new builds. Anto Budiardjo, Clasma, Inc. - April 2003 The enthusiasm of our Advisory and Content Board has been phenomenal and the eagerness of the presenters has been very encouraging. Dr. Kevin Klein, Motorola, Inc. - April 2003 As the trend continues toward automated commercial building environments, the applications become more complex, and the building manager increasingly needs real-time information to diagnose and remedy problems. Jack Chadowitz, President, BostonBase Inc - March 2003 Jack Chadowitz has been involved since 1994 in the design and marketing of Internet based monitoring and control systems. Rob Kapinos, Senior Design Engineer, ACI - March 2003 Humidity and Enthalpy can both be used to determine when you can use the Outdoor Air as your first stage of cooling, thus reducing the overall amount of mechanical cooling or dehumidification that is needed. Anto Budiardjo, President of Clasma, Inc. - February 2003 You need to look at BuilConn as not just another conference or tradeshow. That’s why we called it the “Building Connections Forum”. Glen Allmendinger, President of Harbor Research, Inc. - January 2003 The next "big thing" will be the advent of true web services in a machine-to-machine communications context. That is, information objects from a diverse range of equipment, sub-systems and devices will be able to communicate with no human intervention. Al De Wachter, President, ICS (Independent Control Specialists Inc) - January 2003 We are releasing four different versions or 'levels' of Concerto to match the needs of various clients. This means that contractors who do a lot of repetitive work with small projects can benefit from a streamlined program version, while contractors that get involved in larger projects have access to a full suite of features. What's new in Contractor Cost Estimating Software? Al De Wachter, President of ICS (Independent Control Specialists Inc) - December 2002 This will be the third major estimating software package release for Facility Automation Contractors in our 12+ years of existence. And while we have other programs, Concerto Suite is undeniably our flagship. All the 'good things' in SOCC were retained. Anto Budiardjo, President of Clasma, Inc. - December 2002 Almost all of the integrators, contractors and dealers we have spoken to feel that an event focused on the integration of all of the systems found in buildings is desperately needed. John J. "Jack" Mc Gowan, CEM - November 2002 Newsweek Magazine did a feature article two years ago and predicted that 90% of all four year Universities would offer Online course by 2002. By all accounts that prediction is true, and just one example of the demand for this approach is that the University of Phoenix has 130,000 students enrolled in Online coursework! Thomas M. Kenna, P.E., Director, TAC Learning Americas - November 2002 The fundamentals of education have not changed that much, but the tools we use have. In particular, the delivery method has changed very significantly, especially with the advent of the web and other digital means. By the way, most educator's refer to web-based training as "distance learning", and face-to-face education, as you have called it, as live, or instructor-based education. Anno Scholten, eStuctures, Inc - November 2002 Unlike many other industries, there are currently no forums or independent channels to which researchers working in the building systems industry can present their latest work. This typically means that, at best, research engineers' only opportunity is to present their initiatives to internal members of the corporation for which they work. Anto Budiardjo, Clasma Inc. - October 2002 I have observed in my years that there is no forum, event, expo or any formal gathering that focuses totally on controls. No event or gathering for manufacturers, distributors, integrators, contractors, dealers and resellers to meet. Gary Bark, Sales and Marketing Director, Plexus Technology Ltd - September 2002 Servers should be no more complex to implement than a traditional graphical user interface. This is a very important consideration when buying into Web Serving technology. Ensure that all the tools to configure the Web Servers are included with the product and there are no expensive extras to purchase. Interoperable, Open Systems. Are We There Yet? Ed Richards, Co-founder and Senior VP Business Development, Envenergy, Inc - September 2002 Today, with the advances in high-tech, the opportunity to build a platform for integrating disparate devices, managing in a web-based environment, and interacting with enterprise software applications is possible. Stuart Berjansky, Product Manager, Dimming Advance Transformer Co. - September 2002 A DALI system can add valuable extra flexibility through its feedback of lighting system information to the BMS, automatically identifying failed lamps and ballasts and allowing central monitoring of ballast power and dimming levels. George Thomas, Contemporary Controls - August 2002 You need to understand the rules for the technology you support. Tom Hartman, The Hartman Company - June 2002 I like Web Based remote access because it offers the opportunity for uniform access to systems of many different manufacturers. I would be hard pressed to remember how to access some of the older projects because each dial-up connection uses one-of-a-kind proprietary access procedures. Web Based access promises to develop into a much more standard and universally accessible interface. Easy access from anywhere (faster problem resolution, lower cost). Adds new functionality to older systems (extend system life). Enables competitive pricing on system expansion (web/I interfaces with multiple systems). Easy to support, use and maintain (Lower costs of training and maintaining - reliability). Enterprise wide monitoring through one system (simplify task, lower costs). How are corporations currently using control networks to automate buildings? Kevin Lynch, Echelon - June 2002 In the same way we've seen PC's move from local area networks to essentially global networks via the Internet, we will see control networks become integrated into broader global and enterprise networks. The problems having products support different building automation networks. Henrik Ebeklint, SmartHomeForum/IntelliCom - May 2002 Over the past years all parts in the value-chain have gotten more aware about automation networks and that the systems need to be based on open standards to get the best benefits in the long term. This drives the market to co-operate to form common standards or to develop specifications of how to design communication interfaces to products in a way that makes interoperability (compatibility) between different vendors possible. John J. "Jack" Mc Gowan, CEM - April 2002 AutomatedBuildings.com is offering it's first Web-based training course online. In this month's Interview, Jack McGowan talks with Ken Sinclair about the growth in this approach to professional development and his new seminar. David Clayton, ARC Advisory Group - April 2002 - The ever-changing role of BASs and suppliers represents numerous challenges for these suppliers, but also provides new business opportunities for those willing to adapt to the new demands of the marketplace. Brad Holland, PureChoice - February 2002 In the not-too-distant future, we believe continuous monitoring of indoor environments will be mandatory. Tom Hartman, The Hartman Company - January 2002 We need to avoid participating in the current protocol wars that are much ado about very little, and focus on what will really help make the system you are designing open for the needs of your client. Jim Henry, Electromation, Australia - January 2002 And as BACnet is the only accepted open communication protocol for buildings at the management level, it should be promulgated as the glue for tying all the intelligent processes in a building into one framework. Mats Henriksson, Motorola AB, January 2002 DALI is an industry standard for lighting control applications developed by a group of lamp, ballast, and fixture manufacturers. Tom Hartman, The Hartman Company - November 2001 Demand based control is a lot simpler than conventional control and can reduce the size and complexity of the HVAC systems, but a basic change in how the system is operated has to be made first to achieve this simplicity of configuration and operation. Are All Sensors The Same? Steve Allison, Building Automation Products, Inc. BAPI - November 2001 We need to remember that the details in the design and manufacture of a sensor DOES make a difference in its long-term performance, and reliability. "The Effect of Industry Restructuring on the HVAC Sensor Industry"
Steve Allison, Building Automation Products, Inc. BAPI - November 2001 We believe the industry is a long way from every sensor being intelligent and interoperable, but the trend toward high tech sensors will continue. Frank Capuano, TAC Americas - November 2001 It appeared to me that 90% of the exhibitors were showing solutions in 3 markets, the Building IT market, home automation, and the security industry. Where are Open Systems Today? Anto Budiardjo, TAC Americas - November 2001 The technology needs to be usable by a large number of vendors in many different parts of the building from components, controller and end devices, infrastructure pieces, engineering and analysis tools to operator side products such as HMI, database, alarm handlers and so on. Jim Henry, Chairman BACnet Interest Group – AustralAsia (BIG-AA) - November 2001 BACnet is widely accepted in Australia by the consulting community and we see a large percentage of specifications now calling for BACnet...... Recently, I went to both Korea and Japan. There is a great deal of interest in both countries, as well as China in BACnet. John Petze, Tridium Inc - November 2001 No longer is it necessary to travel from site to site, chasing alarms. The learning curve is dramatically lower than with complex proprietary applications. Simply log on to any browser and check performance in real time. Jack McGowan, Energy Control Inc - October 2001 Take the time to analyze and understand customers and what their needs are in your target market. Develop a quality approach to selling systems that meet the customers needs and help them to carry out their business more cost-effectively, while helping them to achieve their goals. TCP/IP Protocol - The Real Contender? or Back To BACnet? John James, Vice President Products Group, Cimetrics Inc. - September 2001 This is an "apples & oranges" comparison. BACnet objects and LonMark profiles are examples of Application-Layer standards and TCP/IP is a Transport, or Data-Link Layer standard. Edward Hague, Chief Technology Officer, FieldServer Technologies - September 2001 Interoperability in the BAS industry is certainly a challenge. A plethora of legacy, current, and future devices and systems will guarantee that you will have to make these incompatible systems interface. What do We Mean by Open Systems? Rand Arnold, President ControlShop - August 2001 Standards are the foundation upon which openness is built. To achieve any degree of 'openness', certain standards must be established and agreed to. TCP/IP Protocol - The Real Contender? Rehan Kamal, IT Strategist, Computrols - August 2001 Today's BAS standards like BACnet and LonWorks will go the way of BetaMax and Quadraphonic sound. They'll simply be overrun by the revolution in technology that's taking place today. Kevin Lynch, Executive Director, LONMARK® Interoperability Association - August 2001 The building industry is moving rapidly to open systems with open choices, get over it or get out. Gerry Hull, President & CEO, Steve Tom, Director of Technical Information, Automated Logic - July 2001 The RFP and Design/Build approaches allow (force?) the buyer and the contractor to become partners, working together instead of sparring in an adversarial role. Thomas Zaban, Vice President, Marketing Reliable Controls - July 2001 It is only logical, that as open protocols become easier to understand and implement, and as the number and variety of open protocol products become commonplace, that the controls contractor will take on the role of the integrator. Gerry Hull, President & CEO, Steve Tom, Director of Technical Information, Automated Logic - July 2001 In the years to come our identity will become that of system integrators, people who integrate building automation systems into an office network which includes the World Wide Web. Thomas Zaban, Vice President, Marketing Reliable Controls - July 2001 For manufacturers to successfully sell browser based solutions to the HVAC industry we need to involve the human domain of IT. How do we do that successfully? Tom Hartman, The Hartman Company - June 2001 This may dismay a lot of designers, but buildings will be a lot more comfortable for the occupants and profitable for their owners as our industry becomes dominated by or perhaps even assimilated by the IT industry. Jack McGowan, Energy Control Inc - June 2001 I believe that professionals in our industry must become experts in information technology and data communications, but the bottom line is temperature control requires expertise in HVAC.